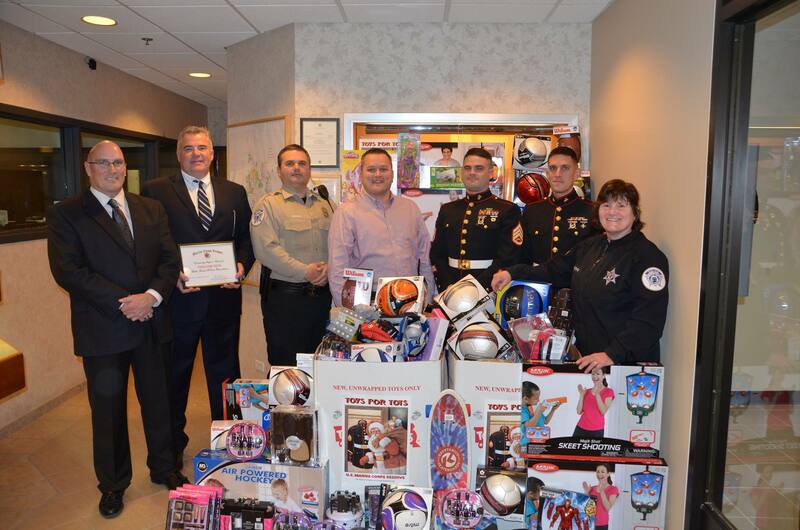 On December 16, 2014, the Marine Air Control Group-48 based at Great Lakes came to the Lake Forest Police Department and collected 7 boxes of new toys for the Toys-for-Tots program. Police Department personnel would like to express its sincere gratitude to The Lake Forest Police Association for its donation of $500.00, the Lake Forest Police Foundation for its contribution of $1000.00, and especially to the countless members of the public who went out of their way and dropped off donations during the weeks leading up to the holidays. Pictured are: LFPD Chief Jim Held, LFPF Board President Terry Rozdolsky, Community Service Officer Will Wright, School Resource Officer Brett Marquette, 2 Marines from MACG-48, and Toys-for-Tots Program Coordinator Records Clerk Nada Sydow. Click here for more information on Toys for Tots.